WHO’S BEEN NIBBLING AT OUR CHURCH? I often wonder how many residents of Trimdon Village pass by the church of St Mary Magdalene – in most cases their church, without giving it another thought? Perhaps they take the church for granted or never see it as they pass by going about their daily lives. Yet a surprising number come to this lovely church, undoubtedly one of the prettiest in the North of England, to marry, christen their children and inevitably, to briefly rest within its portals for a last farewell before taking that final journey. But there are others who come to the church – and stay, much longer than is necessary for a service. They leave their mark, not in the form of a contribution to the collection plate, but in a rather strange and totally surprising way. These visitors are – bees, but there is no need to be alarmed, these are not ordinary bees. They are tiny, solitary, do not build or live in hives, nor do they swarm. Whilst possessing a sting they are not aggressive, unless of course provoked and their sting will not penetrate human skin. They are MASONRY BEES, so-called because it is within holes excavated in masonry that the female of the species nests and lives, breeds and lays her eggs. Each hole a chamber where having laid one solitary egg the bee then seals using mud or chewed leaf material and from which the young bee will hatch perfectly formed. 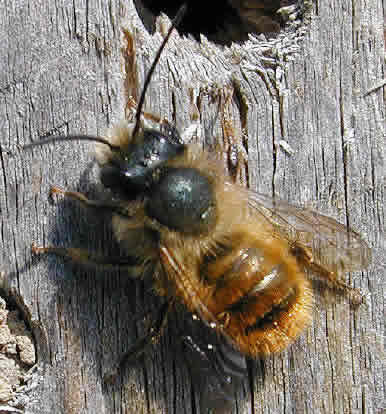 St Mary Magdalene church is largely built of soft sandstone, cob and mortar, the ideal material for these energetic and surprising creatures, each one no bigger than a finger nail, some black, others shiny green or a blue-green and not normally recognised as a bee. That they are more numerous than one would think is borne out by the number of borings to be seen in the south-facing wall of the church. The next time you are passing, spare a few minutes to look. I promise you will be surprised that a creature so small, insignificant and rarely seen should be responsible for such obvious excavations.